Core6410 processor card is designed specially to be the heart of your next embedded design. 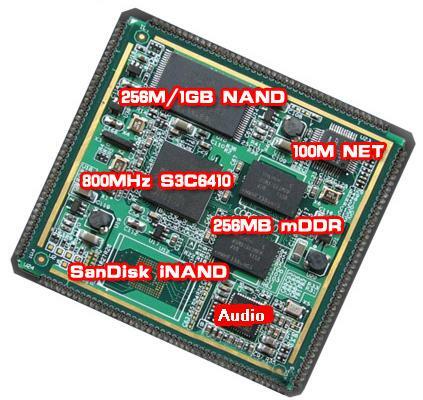 The tiny board integrates Samsung S3C6410 processor (ARM1176JZF-S, up to 800MHz). The processor card takes use of all common features of S3C6410 and the interface between the processor card and your carrierboard is through 170-pin expansion interfaces(QFP package). The Net and audio chip is integrated into the core board. The Audio, Net, USB, LCD, I/O and all other hardware interfaces are all expanded via these interfaces. Integration of the CoreWind Core6410 processor card to customer special design is fully supported by CoreWind technologies. CoreWind also designed an expansion board which can fully evaluate Core6410. The whole system is called Real6410. CoreWind offers Linux 2.6.28, WinCE6.0, Android2.1 BSP for this board. Customers can leverage our experience to increase your own productivity. The optimal embedded microprocessor solution provides users with a flexible development environment based on S3C6410 and a shortened development timeframe. The modular is led out most signals of ARM11 S3C6410, like Matrix Keypad, USB OTG, USB HOST, SDIO, LCD, Touch Screen, Camera, AC97, UART, SPI, I2C, ADC, DAC, PWM, EXT INT, GPIO and so on. CoreWind also offers customer design service based on the Core6410 board according to customer’s requirement. Whether you need to reduce, add or modify to existing hardware, CoreWind will help customers with expert competence and rich experience.